The new version of IATE has a completely renewed look and feel, a more intuitive user interaction and better structured data. Its accessibility has been enhanced (keyboard and screen reader support) and its design is now responsive so that it can be accesses by any device. Search results are more accurate thanks to a detailed filtered search and a domain filtering. The display of the terminology entries has been improved, including the possibility to select a bilingual, trilingual, or the whole multilingual entry. We have been working for more than two years at the Translation Centre for the Bodies of the European Union, with the support of the EU institutions, to provide a more functional, modern, user-friendly IATE. The new IATE has been completely redeveloped with new technologies, a better architecture, a modern design and improved functionalities. The data search and indexing are built with Elasticsearch, which allows numerous adaptations because of its open source technology. The accuracy of the retrieved results has been increased, and the search has been extended to other fields apart from the term. The results page has been improved and offers many more metadata without having to access the full entry. The full view of the entries is much more modular, with a bilingual and trilingual view in columns or a multilingual view in the form of a list. The new IATE offers general statistics in a very visual way, and a user manual with more detailed information than what was offered up to now. The new responsive version adapts to different devices (computer, tablet, mobile) and is made accessible for users with motor or visual disabilities (possibility of using the keyboard for navigation and screen readers). Finally, we provide a search API (Application Programming Interface) so that IATE can be easily queried from other platforms. A second release with advanced data management features for EU terminologists and translatorsis scheduled for late January 2019. Subsequent releases are planned for 2019 with many more features and improvements. We have definitely worked hard to make the new IATE better, and we hope that you will enjoy using it and will help us with your suggestions to improve it even more in the future. We all know the never-ending, love-hate relationship between translators and terminology… now, let’s explore some of the most common errors. Generally speaking, when thinking of terminology, we imagine a glossary, made of two parallel columns full of terms, with the source language on one side and the target language on the other. And what better than an Excel file for this type of structure? Seems easy and intuitive enough. Plus, you can also add an extra column to the right, to add comments or other notes. Well, there’s something wrong here: Excel was never designed to store text, much less terminological data. Yes, you guessed it… Excel was created to crunch numbers, not words! Using Excel files is not an effective or efficient way to manage complex databases. If you use it to create glossaries as mentioned above, you will not be able to specify additional attributes for those terms. It is indeed possible to add extra columns but always limited to one field or category for each term. Last but not least, the glossary you create will feature very poor content – namely, only source language on one side and target language on the other. Using Excel you won’t be able to search or locate all the terms created previously (i.e. in different files). To find a term, you will find yourself guessing n which file it is located. So picture this common situation: you’ve got an unorganized mass of files, divided by project or field, or again a single monolithic file, containing all the terms from your previous translations, but you can’t find anything specific… Nice, uh? Although Excel is widely used in the translation industry, it is regrettably not the ideal way to manage your terminology accurately. If you choose Excel, it’s because it seems easy to use, fast and easily accessible, right from your Office suite of software. And you can easily exchange files with other colleagues. This method is commonly used, yet it is so because there is a significant lack of terminology management programs available on the market. When they do, they are intended mainly for LSPs, corporations and institutions, but never designed or conceived for freelance translators. Apart from using the so-overrated Excel, another very frequent mistake that translators make is treating terminology only in the context of a specific text rather than as a single terminological DB that can be enriched with new terms over time. Translators are by nature careful and scrupulous because their work requires it. But they often have a tendency to manage terminology by opting for quick and painless solutions that, nevertheless, last as long as the translation itself: they are short-term remedies to short-term problems. In my view, when it comes to terminology data management, translators should instead take another route and choose a long-term approach, considering the valuable reuse and exchange of data as a priority in their discipline. 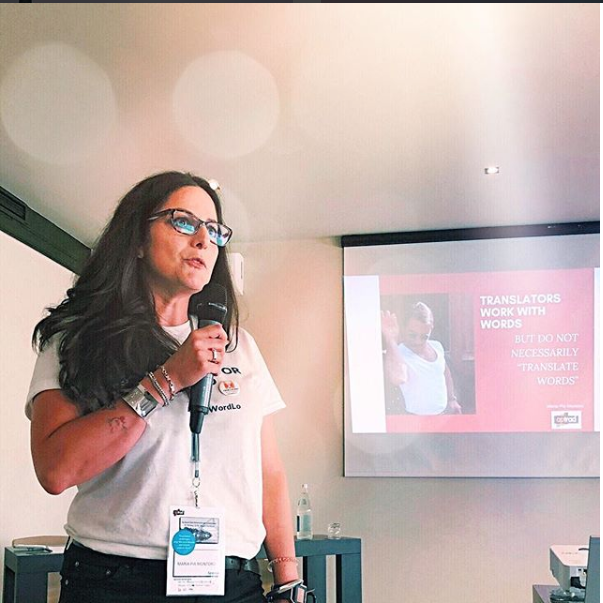 I gave a webinar last June, in collaboration with MateCat, where I provided some key takeaways useful to the freelancer community to deliver quality-based translations, work better and faster. Around 500 participants attended the webinar and actively interacted by posing tons of questions. It turned out to be such an enjoyable experience. 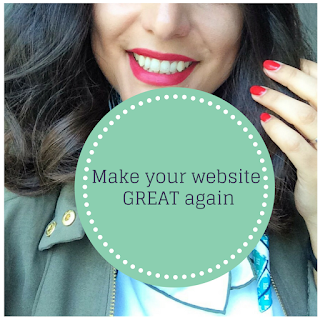 To know more about my webinar and the next ones by MateCat, pls check their Webinars page. If you think about it, salting food isn’t rocket science, but do you know what “a pinch of salt” actually looks like? How about the right way to sprinkle those crystals or flakes? When a cooking step is as straightforward as “just add salt,” it’s easy to gloss over. But since salt is arguably the most important ingredient in the kitchen, it’s worth being 100 percent sure you know exactly how to use it. The same applies to terminology. Terminology is the pinch of salt of translation. Translators are by nature careful and scrupulous because their work requires it. But they often have a tendency to manage terminology by opting for quick and painless solutions that, nevertheless, last as long as the translation itself: they are short-term remedies to short-term problems. By this occasion, I just wanted to thank all my dear friends that came to my presentation and supported me and raised a lot of questions. It counted a lot for me and I appreciated it very much. Talking about #foodporn, espresso in Porto is incredibly GOOD!!! I had the best espresso ever on the Douro Cruise, an unforgettable tasting experience, I took two expressos in a row, sooo good! If you love coffee, Porto is the place to be, you will never be disappointed. And once there, jump on the Douro Cruise for the astonishingly ever-changing landscape. Again, thank you ApTrad for inviting me, looking forward to seeing you soon! Neural machine translation systems offer an opportunity for real progress in the quality of translations produced by machines. However, machine translation still produces unacceptably poor quality content, especially for established brands that (rightly) set a very high bar for their content and brand tone of voice (that can only be set by a good terminology work). Given the huge effort underway to vastly improve machine translation, it’ll likely redefine the role of humans in the translation process. Shouldn't we be looking into ways of making termbases work together with machine translation engines and all the other available CAT-environment tools to contribute quality content? Terminologists need to rise to the challenge of integration with other CAT-environment tools, so that their assets can find their way into the general workflow. This can be achieved only through close cooperation with the developers of technical solutions and by understanding the specific needs of all categories of end user. Translation memory is already able to facilitate faster human translation, providing translators with words and phrases that have already been translated, but only terminology can tell you how something should be translated in the future. Da tempo sui Social come Facebook e Twitter, i traduttori si stanno schierando contro un meccanismo che li spinge ad accettare lavori sottopagati: il pagamento per numero di parole. Il mercato è pieno di balordi, ma anche noi siamo bravi a rovinare il mercato accontentandoci di essere sottopagati, perché non siamo abili nella negoziazione con il cliente e lasciamo quasi sempre vincere lui, come si diceva oggi alla BP Conference. Questo è un meccanismo da smantellare. Mortifica il nostro lavoro e riduce il potenziale del traduttore. Ragioniamo in termini di tempo. Per tradurre 300 parole, abbiamo bisogno di 30 minuti. Queste 300 parole possono essere tradotte in 30 minuti, ma anche in un’ora. Dipende dall’argomento. In alcuni casi c’è bisogno di approfondire, seguire blog del settore, leggere articoli, consultare riferimenti vari, chiedere consigli a esperti. Il punto è che questo: il cliente lo deve sapere, fa parte della nostra professionalità. 300 parole nate dopo una fase di studio durata 2 giorni, non hanno lo stesso valore di 300 parole tradotte 30 minuti. No. Quelle parole valgono quelle ore di approfondimento. E quelle ore di apprendimento si ammortizzano perché utilizzeremo quella ricerca terminologica (che convergerà nei glossari) per altre traduzioni dello stesso argomento, e in quel caso saremo più veloci, perché avremo acquisito esperienza e competenza in quell'ambito. E allora, iniziamo a educare i clienti e le agenzie, rendiamo consapevole il cliente delle difficoltà intrinseche nella traduzione del testo, del rischio (anche economico) di una traduzione sbagliata e di una scelta di termini non corretta (alla BP conference si faceva riferimento anche alla possibiltà di redigere un contratto con il cliente). Iniziamo a liberarci della tariffa a parola iniziando a puntare su di noi, sul valore e sulla qualità della nostra traduzione, sul nostro tempo, sul processo decisionale dietro alla scelta del termine giusto, in poche parole, sulla qualità del nostro lavoro. Noi non lavoriamo semplicemente con le parole, noi gestiamo un patrimonio immateriale: la conoscenza. Hi WordLovers and happy New Year! It is never too late to wish you all the fun you can and a wonderful 2017 ahead! I hope you enjoyed your Christmas holidays as much as I did and that you are finally back to work full of enthusiasm and positive energy. If you are too lazy, you can read the summary below. UI is the real and most interactive part of the website. It must be clear and intuitive; the users must immediately know how to interact with the website and how to find what they need. Wrong wording choices may have a devastating effect. In website UI, terminology is particularly important because UI terms are operational components of the websites themselves. A “terminological makeover” might be needed when inconsistencies throughout the content are spotted. It might depend on the content being written by different editors, thus causing the website to suffer from a lack of uniformity in style and tone and consequently failing to express a clear message. In such case, you need to go through the whole content and review and replace inconsistent terms with the ones provided by the client. I use Google search or the keyword tool on Google AdWords to identify and understand the most popular search terms in a given field, as well as to see what words people are typing in search engines. When search engines do not provide adequate solutions, I have to consult relevant websites to collect search-friendly keywords that users search on key elements of website including title, meta-description, header tags, alt keywords of images, category, etc. New resolutions for translators: let's start to tell a different story! 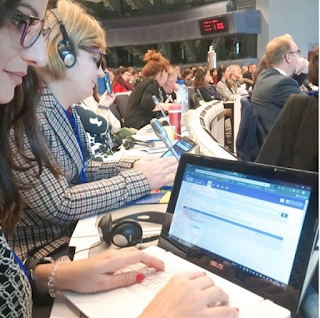 Translating Europe Forum 2016 took place in the wonderful location of the European Commission in Brussels from 27th to 28th October. The discussion was centred around the translation tools and technologies, with a particular focus on the point of view of the end users - the translators themselves. Taking into consideration that the vast majority of translators tend to be apprehensive of language technologies and machine translation, the speakers of the conference reassured us by saying that the human factor is still the crucial element of the translation process. As stressed by Jost Zetzsche, interviewed by the Director-General Rytis Martikonis himself: technology is driven by humans. As language professionals, translators need to be the leaders of technological change in the field of translation, simply for the sake of ensuring that they themselves are content with the accessible software. Since translators are quite literally the main source of income for companies dealing in translation technology, we should focus on communicating with the developers. 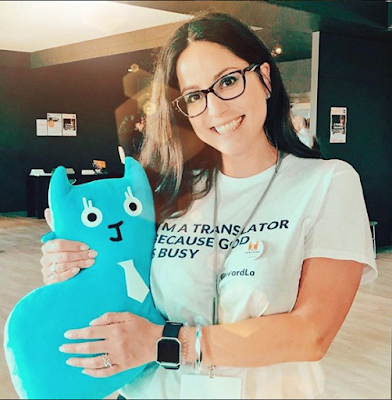 As buyers, and more importantly, as users of their products, translators have an obligation to give tech companies all the necessary feedback that they need in order to improve their translation-assisting products. The end users’ response can affect the development process, making the product more functional and intuitive, fixing bugs, and removing the unnecessary or impractical features. (It also goes without saying aside from improving the product from the user position, we should start developing independent solutions ourselves). There is a prevailing sense of progress in the industry. To ensure that we make the most of the chances offered by it, we have to learn to be early adopters and early adapters: being able to adopt new technologies as they appear, as well as to adapt ourselves to continuous change in the market. With the Internet exploding with an unimaginable amount of multilingual content day by day, the number or translators required in the future is to rise, not to decline. For the same reason, and for the issue of productivity, language technology is here to stay - and if only translators embrace it, we will have an exciting future ahead. The Forum has confirmed that to be successful as a translator, one also needs strategy, management, social skills, empathy, negotiation, and creativity. These irreplaceable human factors will never be replaced by machines. Indeed, the type of labour which is most vulnerable against the rise of technologisation is algorithm-based – the daily work of a translator is everything but. We are not just selling words or fuzzy matches; we are selling our time and the decision-making process behind our choices. It is a highly skilled, creative labour that deserves to be compensated fairly. Let’s start to tell a different story by – first and foremost - respecting ourselves and what we do. Nobody forced us to be translators. We chose it, we studied it, we loved the idea. I wanted to be a translator because I was captivated by Fernanda Pivano. Translation is a high-profile occupation that provokes admiration and fascination. 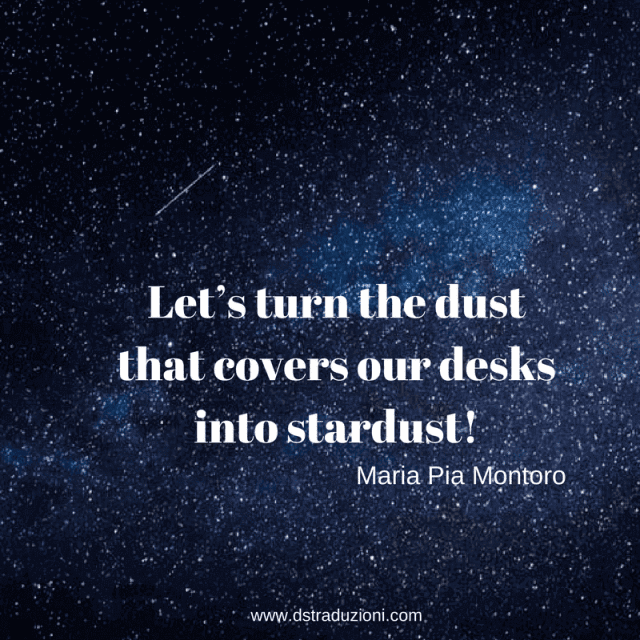 Let’s turn the dust that covers our desks into stardust! How would a collaborative platform improve terminology work? Terminology work has never been a solitary activity: terminologists need subject matter experts while subject matter experts often need the input from language specialists.Collaborative platforms can bring researches and experts closer together in a common strategy. I found my presentation I submitted for my ECQA certification in terminology management. In that presentation (see below) I proposed the idea for a collaborative platform to improve terminology collaboration. Since then, nothing particularly impressive has been created, Most translators, terminologists, content creators do not store terminology in a database. Instead, the tools of choice (or necessity) are either spreadsheets or tables. Terminology management from a content creation perspective is most often a manual process. The terms are gathered manually. The terms are entered into the spreadsheet or table manually. The terms are maintained manually. And the terms are looked up manually. These manual processes are extremely cumbersome. Terminology managed via spreadsheet is almost always out of date. Who has time to work on the terminology list? Usually, the term list is largely ignored until someone realizes that it is useless. However, I have a clear image in mind of how I would implement a collaborative terminology platform. The expectations of quantity and speed of terminology deliveries have changed over the last years, and so have technologies: emails have shortened the distance between a resource and the terminologist but they are more enough! The opportunity of collaborative platforms for terminology management is remarkable: contribution, feedback and voting mechanisms can produce valuable input for many terminology scenarios. Of course, not all terminology tasks can be carried out on a collaborative platform. A collaborative platform adapted to terminological needs would be so much useful to improve collaboration on terminology work. In being a networked, multiuser platform, it would contain functionalities enabling participants to share their knowledge quickly and efficiently. 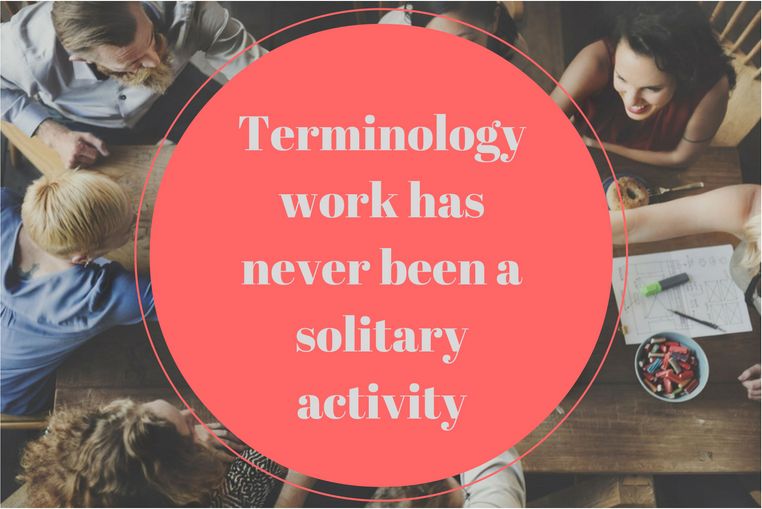 Ideally, terminologist can take the input by their colleagues and use it to produce terminological entries to be stored in termbanks and termbases. The main asset of collaborative platforms is the amount of knowledge contained, access to which would not normally be open to a terminologist in his/her office. A collaborative platform would also reduce the use of emails for terminology work in order to avoid the "depths" of email inboxes: valuable terminology conversations stay trapped in emails, being inaccessible by anyone else who might benefit from them. A collaborative platform captures this implicit knowledge so that it is never lost. Communication is thus made transparent by shifting communication scenarios into the content and social collaboration platform. information integration and indexation of resources - a collaborative platform offers a combination of real-time data coming from the input of the users. A search functionality would suggests search results as the user types – pages, blog posts, files and documents, users everything would be immediately available. Networking, personal learning, and crowdsourcing of terminology work, are among the most effective usages of social media for terminology. 1) Networking: "Do what you love, love what you do... And then SHARE"
Apart from expanding contacts and networking, terminologists can use social networks to get established as professionals who solve terminology problems. They can, for example, research and ask questions to followers and establishing their expertise by answering questions. Social networks make it also easier to improve collaboration with experts to validate terminology and getting feedback and contribution to the terminology work. Social media and blogs enable us to easily focus on the latest news and trends on terminology, providing us with regular updates. Social networks, if properly used, can be effectively used to find terminological resources. Blogs are useful to provide own opinions, reflections and for being an optimal environment for discussing different point of view. Twitter and Google Plus help us disseminate information, get visibility, link to useful information, follow interesting conferences we cannot attend through live-tweeting updates and live streaming (Periscope, Snapchat, Facebook live streaming). 2) Personal Learning Environment: "I am the owner of my learning"
Conscious strategies are involved by using social networks as technological tools to gain access to knowledge. 'Heutagogy' is the neologism hat fully embodies this new approach to technology mediated self education. It means, "I am the owner of my learning at the knowledge society". 3) Crowdsourcing terminology work:"Trust the network - it probably knows more than you do". Since terminology work is expensive, why not involve the crowd to create and validate terminology? The crowd can help with coining new terms or names, vote for term name suggestions, comment on terminological entries. The crowd cannot do it alone but the terminologist has to be part of the process: terminologists, in this scenario, have to adapt themselves into a profile more similar to a mediator. "Crowd" is by the way a generic term. “Nichesourcing” is a more suitable neologism, it stands for “complex tasks distributed amongst a small crowd of amateur experts...rather than the ‘faceless’ crowd” (B.I.Karsch). Old-fashioned terminology is an “in vitro work”: there is no research into term usage, it draws on a limited panel of experts, and takes a long time for validation. Let's share knowledge! Disconnected experts are invisible to the network and irrelevant to the system. BabelNet is the dictionary of the future, it provides the meanings of words with illustrations - and will soon come with videos and animation. It includes entities as well as words, so a search for apple produces results that contain a picture of fruit as well as the famous corporate logo. His creator, RobertoNavigli, a computer scientist and associate professor at Sapienza University in Rome, calls it BabelNet after the biblical tower and the technology he believes can bridge the world’s languages. “The idea is to put a lot of resources together, all the resources that people usually access separately,” he says in an interview published on Times. 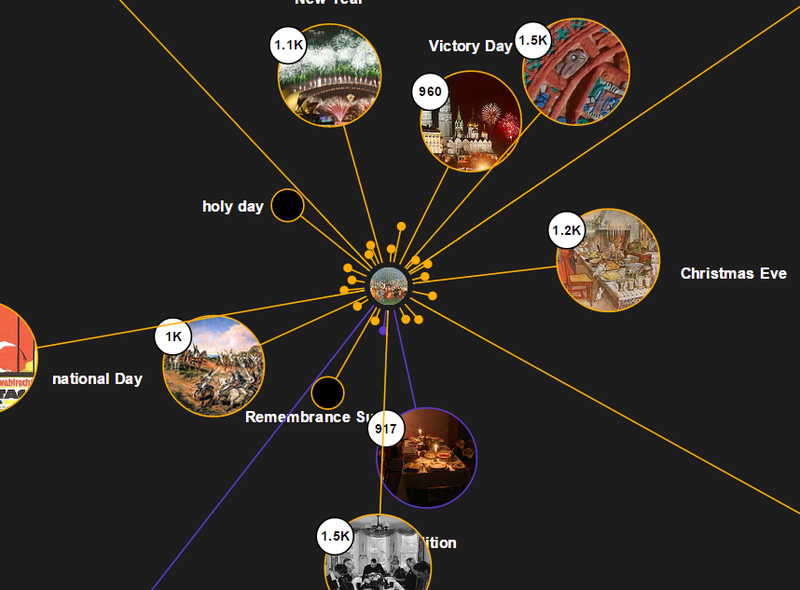 BabelNet, with 14 million entries and information in 271 languages, is the largest multilingual encyclopedic dictionary and semantic network created by means of the integration of the largest multilingual Web encyclopedia - i.e., Wikipedia - with the most popular computational lexicon of English - i.e., WordNet, and other lexical resources such as Wiktionary, OmegaWiki, Wikidata, Open Multilingual WordNet, Wikiquote, VerbNet, Microsoft Terminology, GeoNames, WoNeF, ImageNet, ItalWordNet, Open Dutch WordNet and FrameNet. Babelnet is, and always will be, free for research purposes, including download. Babelscape, a Sapienza startup company, is BabelNet's commercial support arm, thanks to which the project will be continued and improved over time.